Save the Honeybees Milky Way Soap Mold features a beehive, bees, and branches to represent the crucial role honeybees play in pollinating food crops. This mold is perfect for beeswax soaps or lotion bars and was inspired by a concern for the future of the domestic honeybee. 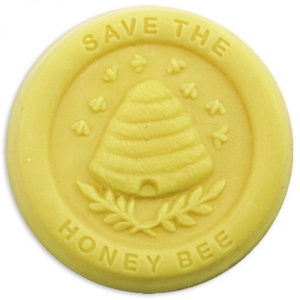 Soap Bar Dimensions: 3" x 1 1/4"
Notify me when Save The Honeybees Soap Mold is in stock.